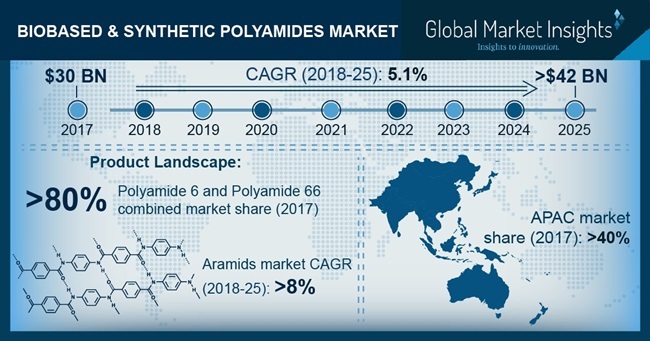 Biobased & Synthetic Polyamides Market Size will surpass USD 42 billion by 2025; according to a new research report by Global Market Insights, Inc.
Strong demand for 3D printing from various end-user industries including: transportation, healthcare and consumer products industries will propel global biobased & synthetic polyamides market size by 2025. The product will hold a substantial potential in a range of 3D printing applications in healthcare segment, such as: orthopedic devices, MRI machines casings, prosthetic body parts, etc., thus driving the overall demand for polyamides. The most common applications of biobased & synthetic polyamides have been: fuel lines, corrugated tubes, hydraulic hoses, transmission oil cooler hoses, coolant & degassing pipes, pneumatic tubes, clutch tubes, servo brakes, filaments, gas transportation, sensors connectors & solenoids, sporting goods, hand held devices, industrial tubes and other hydraulic applications. Polyamide is an ideal solution for vehicle weight reduction. They have been replacing metal parts in automotive with the ease of mass production and molding. These trends depict strong growth aspects for the biobased & synthetic polyamide industry by 2025. Global manufacturing sector has been marked with an overall change in consumer preferences, with rising awareness regarding the impacts of the consumption of non-renewable energy sources on the environment. Demand for renewable source based high-performance materials has been expanding substantially across the globe which is projected to result in an increased consumption of biobased polyamides such as PA 11, PA 10, etc. during the forecast span. Higher production costs of polyamides might have a negative impact on the overall market growth. In 2017, PA 6 and PA 66 together held massive market share surpassing 80% in global biobased & synthetic polyamides market. Biobased Polyamide 11 is expected to witness a faster growth in the next seven years. The robust growth traits of global bioplastics industry present a brighter outlook for the overall biobased polyamides segment during the forecast span. Textiles was a significant end-user segment in global biobased & synthetic polyamides market in 2017. The segment will rise with a CAGR above 4.5% by 2025. Aramids will have strong growth aspects in this area, for their use in military and occupational protective apparels. Stringent guidelines by the U.S. OSHA regarding the occupational safety is likely to boost the protective clothing consumption by 2025, which shall have a positive influence on the overall market size during the forecast span. Asia Pacific led biobased & synthetic polyamides market in 2017 and contributed a market share exceeding 40%. The massive share was attributed to the vast growth indicated especially by the regional construction and automotive industries. According to a report by the UN, the number of cities with 500,000 inhabitants or more is projected to grow by about 30% in Asia by 2030. The rising urbanization and the population feeding requirements in geographies including: India, Taiwan, South Korea and others will lead to significant escalations in the regional industries: construction, healthcare, energy, automotive, food, etc. These traits will have a remarkable potential for biobased & synthetic polyamides market in various applications such as: 3D printing, packaging, industrial coatings, engineering plastics, chemical processing, optical fibers, etc. Major manufacturers have been: Arkema, BASF SE, DSM, UBE INDUSTRIES, Evonik, DowDuPont Inc., EMS-CHEMIE HOLDING AG, Asahi Kasei Corp., Lanxess, Grupa Azoty, RTP Company and others. Companies have been engaged in strategic mergers & acquisitions for strengthening their geographical footprint in order to serve the growing demand for polyamides. BASF’s acquisition of Solvay polyamide business in September 2017 was a notable move in the global polyamide industry.